Sen. Bernie Sanders takes the stage on the first night of the 2016 Democratic National Convention. Some Sanders delegates from two years ago are hoping he wins the Democratic nomination for president in 2020. At the nominating convention in Philadelphia two years ago, he received the loudest reception of any candidate to take the stage that week. And in his speech to delegates from around the country, Sanders did not sound like a man defeated. As a Sanders delegate herself, Jericho resident Maria Rinaldi was there for that speech. And she says she knows precisely how she’d like to see that revolution continue. 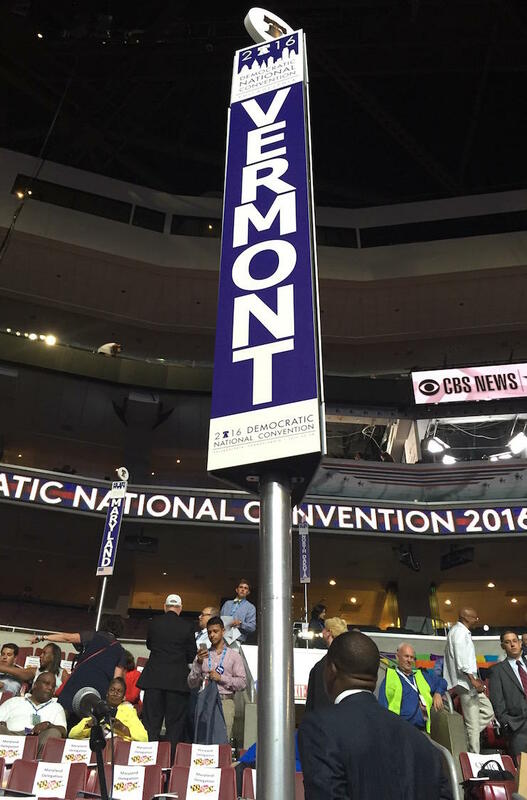 The Vermont sign at the Democratic National Convention in 2016. Many of the Vermont delegates for Bernie Sanders from the 2016 convention say they think he'd make an even better presidential candidate in 2020. Politically at least, it’s been dark days for Rinaldi ever since Donald Trump ascended to the presidency. And as she eyes the 2020 landscape looking for signs of hope, she says there’s still only one place she can find it. “Well at this point there really isn’t anyone that I think could beat Trump but Bernie Sanders,” Rinaldi says. 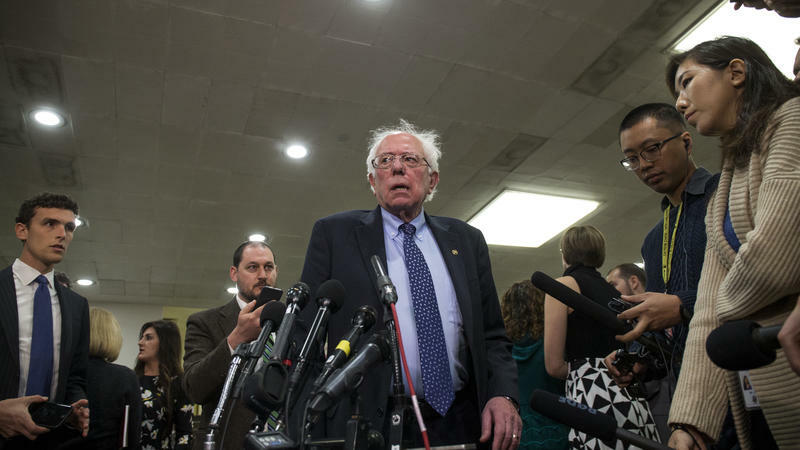 Sanders is already laying the groundwork for another presidential campaign. But one big question looms over his potential candidacy: Can the 77-year-old senator from Vermont recapture the magic that nearly won him the Democratic nomination in 2016? Rinaldi says the senator never lost it. And many of the Vermont delegates for Sanders from 2016 feel similarly. Sabel Courtney, a Burlington resident, is one of the many Sanders delegates praying for another shot at the White House. And she says she thinks Sanders is better positioned now than he was when he launched his first run back in 2015. A recent Des Moines Register/CNN/Mediacom Iowa Poll of likely Democratic caucusgoers in Iowa found former Vice President Joe Biden leading the pack of possible contenders. Sanders was 13 points behind him in second place. And other polls have suggested liberal voters might be looking for some new blood. The Bernie Delegates Network recently voted to relaunch the organization in advance of 2020. And Solomon, a 2016 Sanders delegate from northern California, says its members are ready to unleash the same grassroots apparatus that was so critical to Sanders’ ascension in 2016. That base though isn’t a monolith. And even some of Sanders’ most diehard supporters from 2016, like Canaan resident Martha Allen, aren’t quite ready to commit to him in 2020. “I would love Bernie to continue and do his work, but I think I just want to hear from some of these other people,” Allen says. Allen says her main priority is re-taking the White House. If Sanders proves himself the best candidate to do that, she says she’ll be behind him all the way. But she says Democrats will need to choose wisely. UNICEF has declared the bloody war in Yemen the worst ongoing humanitarian disaster in the world. More than 2 million people are displaced, and more than 85,000 children have died from war-induced famine, with millions more people on the brink of death by starvation. On Thursday, the Senate passed a resolution under the War Powers Act that would end U.S. support for the Saudi-led campaign in Yemen.